For roughly the same period of time as I’ve been doing Drink of the Week, I’ve been attending a series of soirees held about twice every summer and hosted by the Southern California Drive-In Movie Society and ol’ blogging chum, Dennis Cozzalio of the noted cinephile hang, Sergio Leone and the Infield Fly Rule. Don’t tell anyone but, against the rules of drive-ins everywhere, I’ve been smuggling hooch into every single event that I’ve attended. Now, since I prefer my booze in cocktail form, this presents a bit of a problem. Yes, you can try to make a Manhattan at a drive-in, if you’re prepared for messing around with a cocktail shaker out of the back of a car. Even if you do, however — and I was once crazy enough to give it a go — how are you going to properly serve them to several people? Since my definition of “proper” includes a chilled glass made of actual glass, it doesn’t really come together. I’m still perfecting the Road Warrior, which is definitely tiki influenced, but still perhaps a bit too heavy on the sweet. It’s a work in progress, but enough excuses. Let’s see what I can do to make this thing work. Combine all the ingredients in a glass. You can also, of course, multiply the ingredients many times over and prepare the thing in a large thermos or other container and later pour it into whatever sort of cups or glasses are available. Next, stir with plenty of ice and maybe keep stirring. If it’s still too sweet for you, add a few splashes of club soda or seltzer. Prepare for a drink that may or may not taste good, but which should at least improve you enjoyment of an evening of drive-in movie entertainment. In terms of my hard liquors this week, I pretty much stuck to the basics. My 80 proof white rum was Bacardi; my 151 was Trader Vic’s. (So cheap on sale!) The other ingredients were pretty much what I had on hand. Luxardo for the maraschino and limoncello (switching over to Maraska’s maraschino made no real difference). Similarly, using higher end Myers light rum didn’t make a big dent one way or the other. What did make for a very significant improvement was trading up from Dole’s canned pineapple juice to Trader Joe’s extremely tasty not-from-concentrate in a carton. In a very real sense I won’t consider this week’s drink anywhere near completion until I try it out on the friendly folks at this week’s event at the Mission Tiki Drive-In. I will say that I’ve been dosing a willing guinea pig who is not, however, a dyed-in-the-wool cocktail person. The test subject prefers the drink sans soda and enjoys both the sweetness and the undeniable kick-assyness that the 151 adds, but at this point I still find that adding a bit time seltzer/club soda spritz helps a great deal. Stay tuned. On Sunday I promise to report back with a brief update on the reaction and my semi-final verdict on the Road Warrior. UPDATE: It’s Sunday early afternoon as I write this. And, while I insist that Dennis Cozzalio’s delicious home made breaded chicken and cous-cous was much tastier than the Road Warrior, Dennis and few other people seemed very happy with the drink indeed. Notably, however, they all took my advice and had it with a few splashes of soda water. I’m still unconvinced the drink is a flat-out success but who am I to argue? I will say that I found myself enjoying “American Ultra” more than I might have expected, I did find myself nodding off during “The Man from UNCLE,” despite some obviously gorgeous filmmaking (from Guy Ritchie???) and crackerjack performances. Alcohol and cinema make great companions, but there can be a price! It’s probably not the focus of your weekend plans, but you might be interested to know that this Sunday is National Rum Day. I wound up getting a few pitches for rum-based cocktails for the day, but the makers of Shellback Silver Rum got to me first with a pretty interesting variation on possibly the most popular of all rum drinks (as well as the usual free bottle in the mail). It’s a pretty good way to show off their light rum, an intriguingly vanilla-forward entry in the very crowded silver rum arena. Still, there’s nothing at all nefarious about the Brojito Mojito and it’s probably not fair to compare it to the fascistic criminal from John Huston’s enjoyably overheated film noir. It’s a tasty and fun variation on a drink with a great many variations. If more isn’t always more, it’s often very nice indeed. Start with a highball/collins glass and add the mint leaves. I personally get impatient counting out ten to fifteen mint leaves and therefore prefer to think of it variously as either a “bunch” of mint leaves or perhaps a “buttload of mint leaves.” Muddle them very lightly — you don’t want to bring out of the bitterness that over-muddling can result in. A light tap or two will suffice. Next, add all the liquid ingredients and stir. Then add plenty of ice and stir some more. Prepare for one big mojito. I have to admit I’m not in love with the name but, beyond that, this is a pretty decent not-so-little beverage with a nice kick. It’s a bit on the sweet side, but it’s balanced by the addition of the very strong, somewhat bitter anise flavors of an absinthe, or the somewhat milder variation of Herbsaint (marketed as substitute absinthe, back when absinthe was illegal,). I leaned slightly towards the absinthe simply because, with an entire ounce of simple syrup and a relatively sweet base spirit, the Brojito Mojito is plenty sweet enough and needs as much counterpoint as it can get. Finally, regular readers might notice that I didn’t include an option for using superfine sugar in place of simple syrup. That’s because — and I have no idea why this should be — the result simply didn’t taste very good. Don’t ask me why. The ways of cocktails, like the ways of men, are mysterious. The Whiskey Smash is probably one of the clearest examples of a drink rescued from complete obscurity by the ongoing classic cocktail revival. 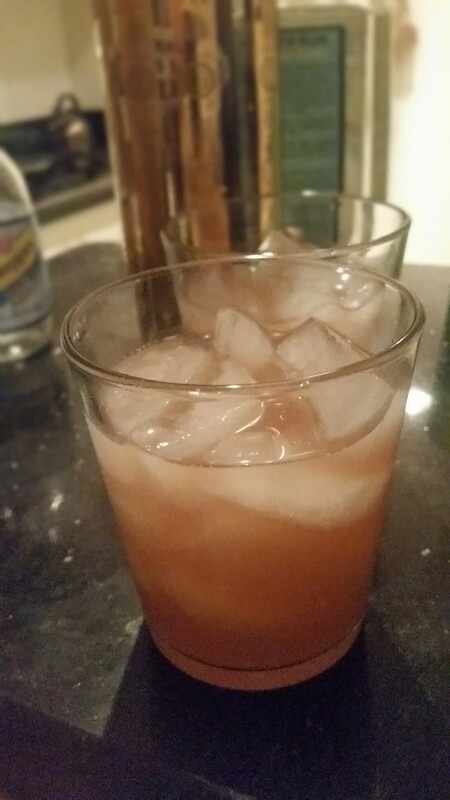 Although the modern version featured in a growing number of retro-friendly bars differs enough from the recipe written up by cocktail pioneer Jerry Thomas in 1862 to be an entirely different cocktail, the more polished and slightly more elaborate version below is certainly a classic of sorts. As it stands, the Whiskey Smash is a close relative of the Mojito and the (I swear upcoming) Mint Julep. It’s outstanding for a warm day or in a bar so crowded if feels like a warm day. Certainly if you’re a fan of whiskey, lemon, mint, and heavy muddling, this is your drink. Muddle it all rather intensely, paying special attention to give a good mushing to the lemon pieces — this is a “smash” after all. You can take it a bit easier on the mint if you like. Make sure, however, that your sugar is dissolved in the liquid, which should happen without too much effort if you’re using superfine sugar and not cheating with ordinary table sugar. Add lots of ice — cracked or crushed ice is probably better — and shake vigorously. Strain into a well chilled old fashioned glass with a few ice cubes in it. Because of all the lemon, mint, and crushed ice you may have to exercise a bit more patience at the straining stage, but your forebearance will shortly be rewarded. If you’d like an extra dash of sweetness and color, add a maraschino cherry along with the semi-obligatory mint-spring. I’ve also noticed there’s something of a fetish among bartenders not to end up with bits of mint in the final, strained drink. It happened to me a lot of the time, and it wasn’t a problem either in terms of taste or aesthetics, in my view. And just a reminder that you will really need a good, solid muddler suitable for lemon smashing as described so long ago in our guide to bar implements. If you don’t have one, you can improvise but you want something solid. A freshly washed hammer used with extreme caution, perhaps. Yes, I’ve been putting it off. Forgive me, I know not why I waited. The Mojito might be the trendiest drink going right now and there are the usual cocktail abuses committed by misguided bars, but overall it’s the kind of booze trend that even a staunch cocktail classicist can support. Like so many classic cocktails, this venerable Cuban creation is a sturdy drink — great in the hot, moistish weather we’re still kinda sorta having in Southern California — that can bear a number of variations and is actually quite easy to make. And, or so the Wikipedians tell us, it’s possibly a relatively ancient drink and was even approved of by the Cuba and daiquiri loving Ernest Hemingway. What other encouragement do you need? Combine lime juice and sugar — use more sugar to go with more lime juice or less to go with less — with mint in the bottle of an old fashioned glass or, perhaps, a smallish collins glass. Muddle enough to mix the sugar and juice and also lightly smash the mint leaves; they need not be pulverized. Add ice — very preferably crushed ice. Also add the spent lime wedges from your juicing. Stir vigorously with a swizzle stick or bar spoon — enough to melt some of the ice. Then, top off with a small amount of club soda or plain sparking water/seltzer and stir a bit more. It’s important to remember that last step. I know because I forgot a couple of times and wondered what was missing. Without just a dash of sparkle, a mojito fails to come alive. Though I provided a fair amount of flexibility above, there really are an enormous number of ways to skin the mojito cat and the ‘net provides no end of options. Even so, the simplest way I found was demonstrated by Rachel Maddow on a recent segment highlighted by this reasonable thought: “nuns deserve good drinks.” Her version was fairly similar to the way I make a caipirinha and involved less squeezing and measuring and definitely called for a wide-bottomed rocks glass on account of some heavy duty muddling. You basically just cut up a lime, throw in an entire tablespoon of sugar (!) and smash the heck out of it along with the mint leaves. I found that version worked very nicely, but I was, to my own surprise, actually drawn more to the more squeezey/less smashy low lime juice and low sugar version promulgated by David Wondrich. If you keep the lime juice to 1/2 ounce, the natural sweetness of the rum and just one teaspoon of sugar is plenty to create a really full bodied refreshment. Still, the other ways are not one bit bad. There are doubtless many roads to mojito hell, most of them involving sour mix or who knows what other kinds of chemical monstrosities, but just as many paths to mojito enlightenment.